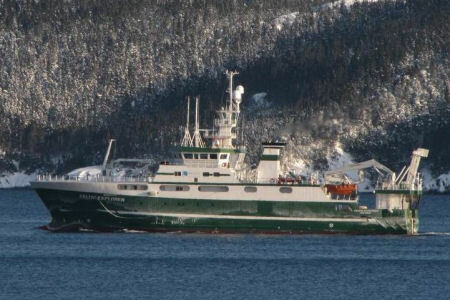 Following her arrival in St. John's Newfoundland and a welcome reception, the RV Celtic Explorer begins her mission on the Newfoundland & Labrador Fishery Survey. Scientists from Newfoundland take up the blog . . . Forget the lovely bacon-wrapped scallops and jerk chicken strips served at the Portabello’s reception in St. John’s, never mind our romantic departure through the Narrows; what sticks for us so far is the wind-whipped snow-drift’d first night in Trinity Bay preparing to test the survey trawl. 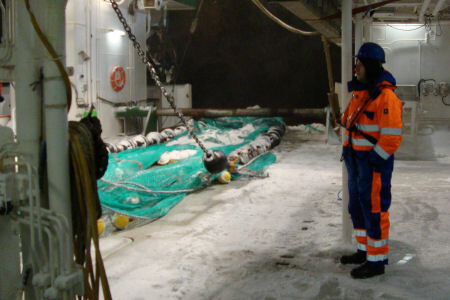 Even the long seasoned Irish fishermen took snaps of the frozen trawl and sideways blowing snow. Those of us underdressed that night met a piercing cold which ushered us back into the protection of the Dry Lab or to our bunks to sleep off the first night at sea. The hardiest that night were the fishermen in their winter-ready coveralls, and gear technician Harold DeLouche from Newfoundland & Labrador’s Marine Institute. We woke the next morning to a spectacular crisp winter day anchored in Bull Arm, Trinity Bay, to calibrate the EK60. We completed the calibration by suspending a reference sphere underneath the EK60’s transducer and making adjustments based on signal strength. Calibration a time consuming process, but it ensures the data we collect will be of the highest precision. Hauling anchor that evening we steamed back into Trinity Bay for a second night of gear testing and preparation to run survey transects in Smith Sound at first light. Tom Clinch from Petley took a few snaps as Celtic Explorer passed his home yesterday early. Tom is a fine photographer, and Celtic Explorer makes a fine subject. Late yesterday we let off DeLouche and Susan Fudge in Random Sound’s Southwest Arm in Trinity Bay. 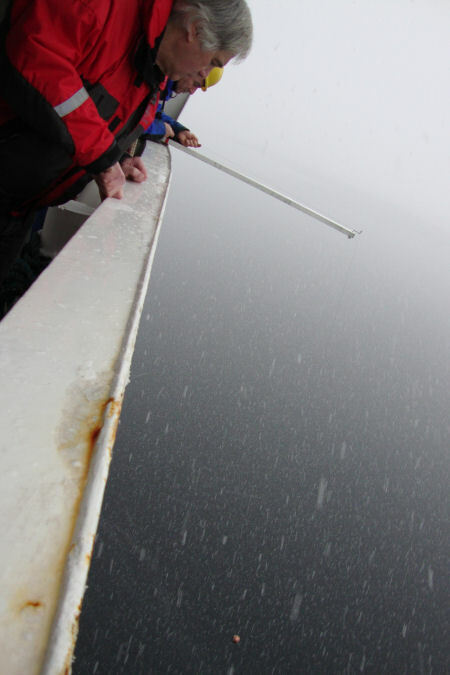 DeLouche was aboard only to help us properly deploy the Campelen survey trawl. Fudge, one of Dr. George Rose’s many prodigies, came along to observe for a few days before returning to her regular work and waiting family. After leaving DeLouche and Fudge we began the long steam to Northern Labrador, leaving the calm waters of Trinity Bay behind for the North Atlantic. At present we are 10 miles Northeast of Funk Island, heading Northwest by North. Cecil Bannister, a Newfoundland fisherman accompanying the entire survey, just checked in to see that all is well. It’s grey, cold, and the 3-meter swell is rolling us just so to keep some of the new scientists in their bunks with wobbly knees and upset stomachs. Despite this inner-ear adversity, the scientists are adjusting well to their new life at sea, making friends among the crew, and all aboard are in good spirits.